Ohh, you're little ghosties are sooo cute Nic!!! I have all of Rachel Allen's cookbooks. I love her style of cooking. She's one of my favourite cookbook authors! Wherever did you get that adorable cookie cutter! Adorable!! And I love the idea of coffee cookies as an alternative to gingerbread cookies. Thanks! Those little ghosts look fab Nic. Just looking at them makes me smile, now if I had to dunk one I'd be even happier! What cute cookies! Love the faces. These are sooo cute! Yummy recipe too! Never thought of coffee cookies. I have a huge smile on my face right now. I'll have to bookmark these coffee delights for next Hallowe'en!! Thanks Jeanne - they do make a great alternative to gingerbread. Sylvie - welcome to my blog - and the world of food blogging! Thank you Brilynn, M&Ms, Valli and Half Baked. 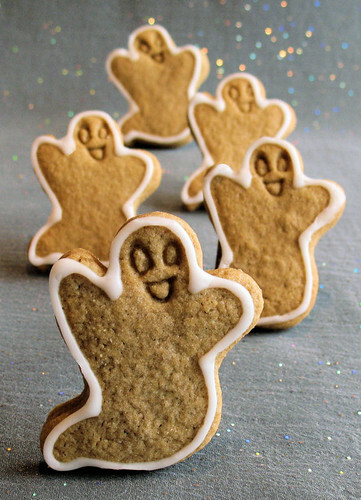 These ghosts are so cute! I love their faces, and the way they are outlined, rather than being totally white. Great job! Rasa - thanks so much!